. . . . A noted Anglican divine, Thomas Bray, reported on wretched jail conditions to the Society for Promoting Christian Knowledge at the turn of the eighteenth century . . . .
Bray recommended official inspections; the prohibition of liquor and wine; the abolition of such old customs as garnish and chummage, under which incoming inmates were compelled to part with either their money or their clothing; segregation of the sexes; the separation of old from young offenders; systematic labor; and the promulgation of specific prison rules. Bray’s work was carried on by his friend and associate James Edward Oglethorpe, who headed a parliamentary committee which exposed vile conditions existing in various debtors’ prisons in 1729 and 1730. . . . 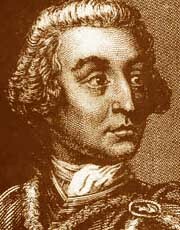 The concern of Bray and Oglethorpe for imprisoned debtors also helped lead to the establishment of the American colony of Georgia in 1732. The Rev. 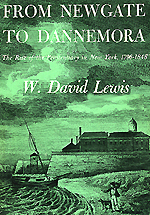 Thomas Bray image above and the James Edward Oglethorpe image below do not appear in From Newgate to Dannemora. The Bray image appears on the web site of Society for Promoting Christian Knowledge (SPCK). The Oglethorpe image appears on the web site of National Park Service (NPS). As the work of Bray and Oglethorpe shows, the shortcomings of English prisons troubled an occasional Anglican churchman. Of more importance for British and American penal reform, however, were the efforts of various reformers who belonged to the Society of Friends. Like William Penn, who was imprisoned three times prior to the founding of Pennsylvania, many Quakers had learned at first hand the terrors of confinement in typical English jails. Their belief in the doctrine of the “inner light” led them to seek not only to better prison conditions but also to convince their contemporaries that the aim of penal treatment should be to reform rather than to punish. A good example of an early Quaker prison reformer was John Bellers, a cloth merchant. Bellers . . . advocated strict regulation of prisons, suitable employment for inmates, restrictions upon the selling of intoxicating drinks in jails, and an end to the practice of allowing wealthy prisoners to buy special indulgences. . . .
Bellers knew William Penn and probably had a direct influence upon the Proprietor’s thinking. . . . Together these two men drafted comprehensive legislation authorizing the construction of national penitentiaries, the use of hard labor within them, the provision of proper food and clothing for inmates, and the maintenance of strict institutional discipline. Passed by Parliament in 1779, the Hard Labour Act['s] promising prospects did not materialize . . . The new measure . . . aroused opposition from a number of persons who pointed out that it permitted convicts to work together during the daytime and thus gave them a chance to corrupt one another. 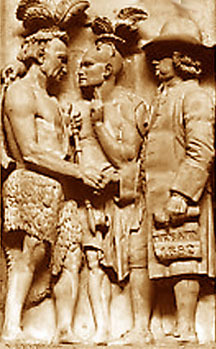 The above Wm Penn treaty image -- based on the 1827 sandstone U.S. Capitol Rotunda frieze by Nicholas Gevelot (over north door) -- does not appear in From Newgate to Dannemora. Clicking the image accesses the Architect of the Capitol web page where the uncropped original grayscale image appears. 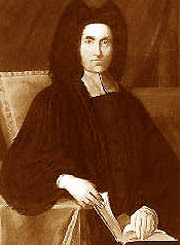 Penn, whose Quaker activities led to his being jailed thrice, became one of America's earliest champions of religious freedom. His famed Liberty of Conscience treatise was written while "a Prisoner for Conscience-Sake" in London's Newgate Prison 1670. Thus was provided a preliminary airing of an issue which split nineteenth century prison reformers into opposing camps and provided the basis for the bitter disputes which took place between adherents of the Auburn and Pennsylvania systems. Howard believed that it was necessary to separate convicts at night. He was nevertheless willing to allow group employment by day, possibly because he thought that adequate techniques of supervision could be devised and believed that joint labor would be economically advantageous. . . .
Another champion of utter solitude was Sir George Paul, later to become a significant penal administrator and pioneer in the building and management of Gloucester Penitentiary. Paul believed in the reformability of criminals, but held that this was best accomplished by preventing any contact between prisoners. The most prominent advocate of strict solitary confinement, however, was probably Jonas Hanway . . . . In 1776, three years before the passage of the “Hard Labour Act,” Hanway laid down a plan for a model institution which would ensure the complete isolation of its inmates. Here, about fifty years before the building of the Eastern State Penitentiary in Philadelphia, was a vision of how to implement what later became famous as the Pennsylvania system. . . . The Eastern State Penitentiary images above and below do not appear in From Newgate to Dannemora but do appear elsewhere on this web site in an NYCHS excerpts presentation of On the Penitentiary System in the U.S. and Its Application in France by Gustave de Beaumont & Alexis de Tocqueville. Clicking either image accesses that page. The extent to which the opposition of such men as Hanway contributed to the failure of the “Hard Labour Act” is only conjectural. Doubtless the dissension that prevailed in the committee charged with executing the law was partly responsible for the fact that the statute was not effectively implemented. While reformers quarreled the government sidestepped the controversy and resorted to such expedients as brutalizing and pestilential prison ships or to the old remedy of deportation, this time to Australia. A second penitentiary act was passed in 1791, but its provisions were permissive and it could not be enforced. Three years later, Parliament endorsed Bentham’s Panopticon system, but difficulties involving the selection of a site and the purchasing of land wrecked the project and made it one of the most disappointing episodes of the utilitarian philosopher’s career. Further action to establish a penitentiary system was not taken until after the end of the Napoleonic Wars, when construction was begun on Millbank prison. . . .
Like the British Hard Labour Act, the French [prison reform] law of 1791 passed into oblivion; the vicissitudes of war and revolution provided an inhospitable atmosphere . . . . Even in Ghent, discipline deteriorated at the celebrated Maison de Force, and the practice of keeping inmates separated at night was discontinued . . . . In looking hack over the evolution of penal methods in Europe, therefore, it becomes clear that the United States was less the originator of the penitentiary system than the recipient of a long tradition which European countries carried to the point of climax but failed to culminate. While the Napoleonic Wars raged in the Old World, leadership in correctional matters passed to America more or less by default. But this in no way diminishes the importance of what was achieved in the United States. In building upon European precedents, making a pragmatic test of theories originally conceived across the Atlantic, and from time to time adding new ideas and techniques of their own, American reformers made a noteworthy contribution to the development of modern penology. With the construction of Newgate prison under way in 1796, Thomas Eddy and his fellow New Yorkers took their place beside Pennsylvania humanitarians in the vanguard of this significant effort.